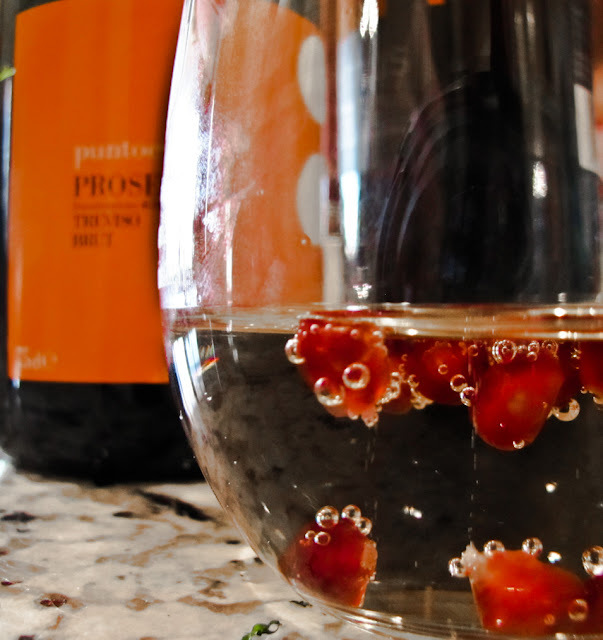 If you like to play with your food, you will love playing with your bubbly beverages. Scatter a tablespoon of fresh pomegranate seeds over the bottom of a flute or wineglass, gently add Prosecco or champagne to fill, and wait! there they go! Bubbles attach to the seeds and float them to the top, detach and let the seeds descend to the bottom again. Over and over the pomegranate seeds bounce up and down, up and down... Is it magic? it's certainly fun to watch the action as you sip the beverage. Does this work with a classic champagne cocktail or bellini? Hmmmm, I don't know but definitely need to investigate this, all in the name of research of course. Thank you friend Cathy S., for introducing me to this captivating occurrence. Now about that Thanksgiving menu report I mentioned last week: plans changed. The Thursday menu was completely ignored as flight attendant H was called out to work all day and Grandma's plane arrived so late in the evening that she just wanted to go to bed. Postpone that menu until later in the week, and reorganize the refrigerator. On Friday we ate appetizers and green salad from the Thursday menu, opted to skip the potatoes, and were too full for any dessert... except H's decorated cookies. Okay, I confess we nibbled on a lot of cookies. Hot turkey sandwiches, cold turkey sandwiches and turkey quesadillas took care of the leftovers on Saturday and Sunday. Grandma flew home, the fridge is empty and it's time to think about December activities. Let's start with some bubbly. 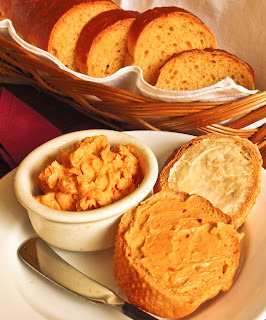 While I skimmed my assigned SRC blog for November I fell in love with several recipes, and Chipotle Cheese Bread with Chipotle Butter was one of them. As an unabashed breadaholic, I knew I had to try this one, immediately. WINNER! I added 2 minced chipotles and 8 ounces of shredded pepper jack cheese to my standard baguette recipe (link) and loved the flavor pop. The first slice from a still-warm loaf was tasty, and several grilled and toasted slices were even better. The chili and cheese flavoring was subtle, but distinct. That said, the true AHA! moment came when I sampled the Chipotle Butter. OMG it was good! Chipotle chills, adobo sauce, lime juice and zest add a special something that takes the flavor of sweet butter over the top. 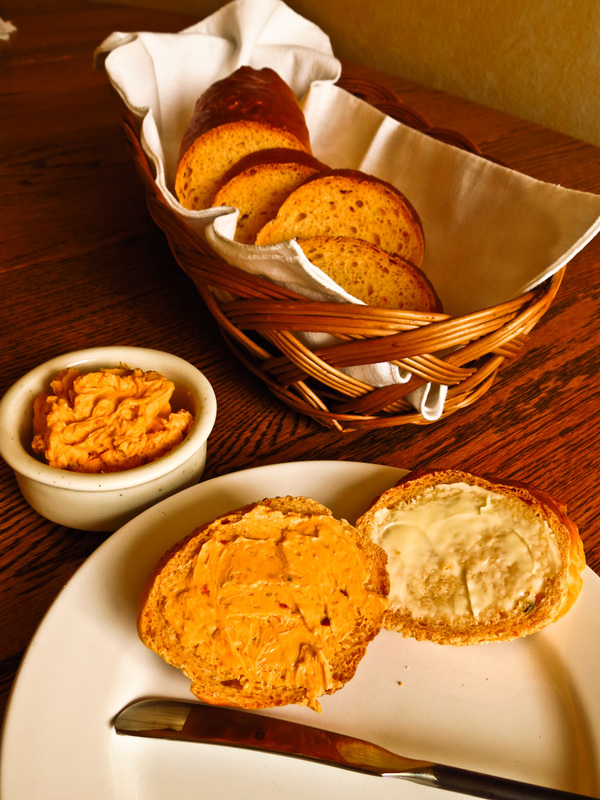 Enjoy this flavored butter with Chipotle Cheese Bread, and then experiment with it to add a bit of chili heat and citrus zip to other dishes. The chipotle butter is terrific on biscuits, toast, tortillas, pasta, potatoes, vegetables, chicken... It disappears so quickly I think "someone" is eating it straight! Place yeast, sugar and 1/2 cup warm water in a mixing bowl; stir to blend. Let stand 10 minutes or until it grows foamy. Add 2 cups warm water and the salt; stir to blend. Add 2 cups flour; stir to combine. 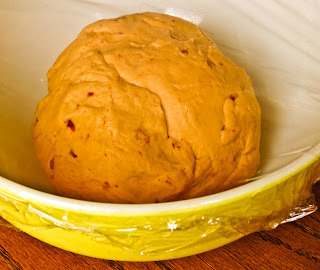 Add minced chipotles and shredded cheese and mix to incorporate into the dough. Add remaining flour 1 cup at a time as needed to make a relatively stiff dough, mixing well after each addition. (If mixing by hand use a whisk for the first 3 cups of flour and then switch to a wooden spoon.). Switch to the bread hook and knead for about 7 minutes. (If kneading by hand, turn out on a lightly-floured board or countertop and knead for 8 to 10 minutes until the texture smooths out, adding additional flour only as needed. Punch down dough and give it another knead or two. Place in a bread pan sprayed with PAM or greased with shortening and dusted lightly with cornmeal. Do the same with the remaining three loaves. Cover with a dampened tea towel and let rise again in the pans until they are doubled (or the size you want them to be), usually less than an hour. You can also shape each piece of dough into a boule (ball) for round loaves. Place pans in a preheated 375-400 F oven with a small pan of water beneath the bread pans. Bake for 30-40 minutes or until loaves are golden brown. Remove from the oven and remove from pans, allowing to cool on a baking rack. If you aren’t going to eat all of them right away, wrap in foil and place in the freezer. When ready to use, unwrap and heat in a 350 oven for 15-20 minutes. This makes 4 small bread pan loaves or baguettes. Place all ingredients in a food processor and pulse to blend until fully mixed. (Pulse to whip the butter, not melt it.) Transfer to a covered container and refrigerate until ready to use. Return to room temperature before serving. Blog Checking lines: Audax of Audax Artifax was our November 2012 Daring Cooks’ host. Audax has brought us into the world of brining and roasting, where we brined meat and vegetables and roasted them afterwards for a delicious meal! Brining wasn't a new technique, I have brined chicken before and been pleased with the results. Planning ahead to brine or marinate takes organization, preplanning, commitment to a preparation, so it doesn't happen often in my kitchen or galley. This challenge was the perfect opportunity to see what a brine bath would do for a thick, lean pork chop. RL swears I'm pork challenged lately, overcooking the chops or managing to serve them plenty pink but too tough to chew. Would brining make a difference and salvage my reputation? Not on the first try, OH MY those chops were salty. The six-hour soak in brine was followed by a rinse, pat dry and air dry sequence. Next came a stove-top sear in a cast-iron skillet for color and a finish in a hot oven. Taste test: attractive appearance, interior nicely pink, but too salty to enjoy for more than a bite or two. We gave up and ate ice cream sundaes for dinner that night. The second try was much more successful. I reduced the salt in the brine by half and soaked the chops for 90 minutes. This time I used a cast-iron grill pan to sear the chops and for the oven roast as well. The interior temperature registered 145 F when the meat came out to rest. Taste test: attractive appearance, flavorful and not too salty, but the finished chops were a bit too done when served. I'll pull them out of the oven at 140 F next time. I fretted over the possibility of a second failure and served several side dishes "just in case", but needn't have worried. These brined and roasted pork chops were well-received - along with accompanying wild rice, stuffed mushrooms, and roasted carrots, red potatoes and fennel wedges. No bowl of ice cream was needed that night. Combine brine ingredients in a large saucepan and bring to a boil; reduce heat and simmer for 15 minutes. Cool brine completely. Transfer to a large bowl or heavy 2-gallon Ziploc bag. Add pork chops and refrigerate, covered, for at least 1 day an hour or two. Place a rack in the middle of the oven and preheat to 425 F.
Transfer chops to a platter and let stand, loosely covered with foil, for 10 minutes. Their internal temperature will rise 10-15 degrees as they stand. For November's Secret Recipe Club post I was assigned Lynne Daley's blog Cafelynnylu, and what fun I've had exploring the recipes and admiring her photography. Indeed, so much fun that it was difficult to choose just one recipe. I tried to ignore the tempting sweets and focus on a few of the savory selections. Chipotle Cheese Baguettes were tasty, the accompanying Chipotle Butter was awesome, and the Pistachio, Mango and Blood Orange Terrine is still on my must-try list. 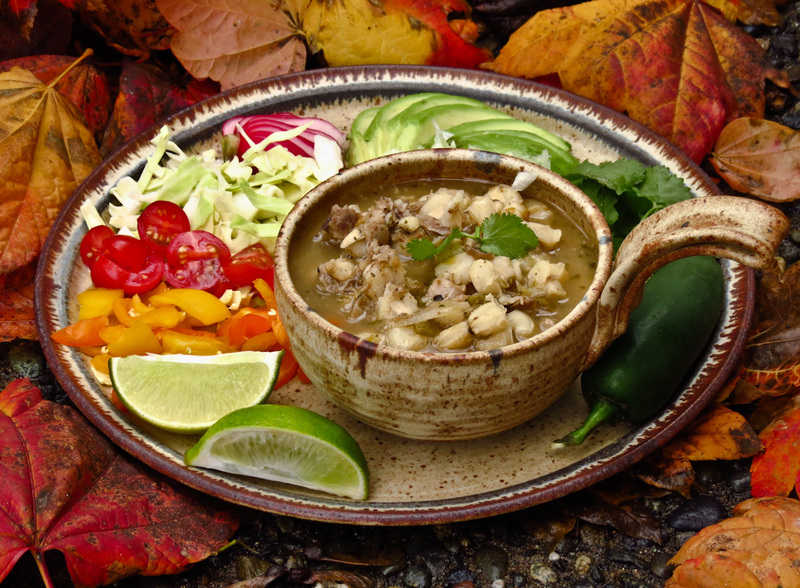 In the end, the Green Pozole with Chicken was voted our favorite taste treat. The basic broth, whether made with chicken, turkey or the more traditional pork, offers a mellow blend of flavors that provide a nice bowl of soup. It's the handfuls of toppings that add crunch and zest to transform this soup into something beyond special. Oh yes, pozole is that good. Pozole (or posole) is a go-to favorite in cool weather, its tantalizing aroma draws crowds of taste testers seeking an early sample. 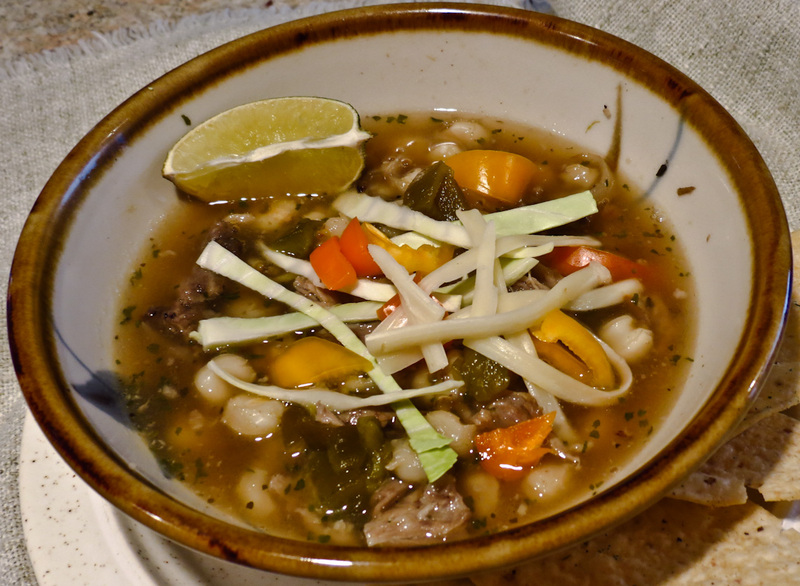 If you have the time, prepare pozole the slow-cook way, it can make a difference. Soak dried hominy overnight and then simmer it gently for an hour or two to bloom and soften. Roast/grill the fresh tomatillos and peppers for extra flavor. Use fresh bone-in chicken thighs with skin for even more flavor. OR, if you're in a bit of a hurry, substitute some canned hominy and chicken broth, even deli roast chicken meat and some mild canned chiles. (I'm not a fan of canned tomatillos, I think they taste a bit tinny, but that's just me.) Either way, be prepared for a tasty bowl of comfort. Top your bowl of pozole with a squeeze of lime and a generous handful of "accompaniments" to suit your taste. Do experiment with the toppings, go a little crazy, and enjoy a delicious bowl of pozole. and fresh cilantro. Tortilla chips or toasted tortilla pieces and shredded pepperjack cheese are also favorite toppings. Bring to a boil in a large heavy covered pot 8 cups water, bay leaf, half of onion, half of garlic, and 1 teaspoon salt. Reduce heat and simmer 10 minutes. Add chicken and poach at a barely bubbling simmer, uncovered, skimming off any foam, until just cooked through, about 15-20 minutes. Transfer chicken to a cutting board to cool. Strain broth through a fine-mesh sieve into a large bowl, discarding solids, and reserve. (Skim fat from top of broth as it cools, if you wish.) When chicken has cooled enough to handle, use your fingers to remove skin and bones, pulling meat apart into small chunks and coarse shreds. Roast the poblano, tomatillos and remaining onion under the broiler, browning on all sides. 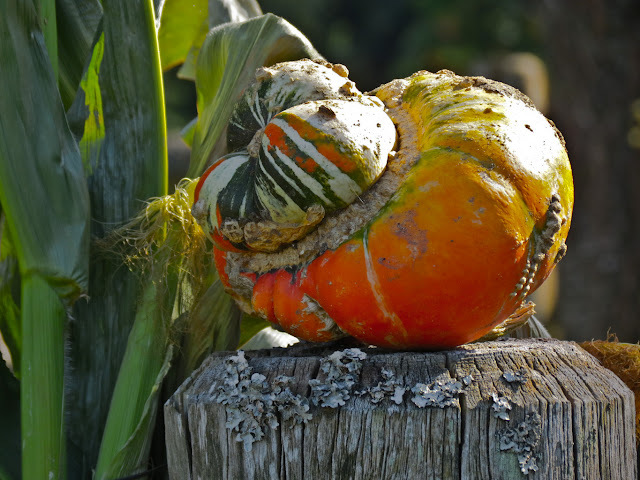 Remove the stem, seeds and membrane strands from the poblano. Purée in a blender with 1/4 cup cilantro, oregano, remaining garlic, and remaining 1 teaspoon salt. Heat oil in a large heavy-bottomed pot over medium high heat until hot but not smoking, then add purée (beware, it will splatter and steam). Cook, uncovered, stirring frequently, until thickened, about 10 minutes. Stir in 1 cup reserved broth and simmer 5 minutes. Stir in shredded chicken, hominy, and the remaining cups reserved broth and simmer, partially covered, 20 minutes. Taste and adjust seasonings as needed. (I added a few splashes of Green Tabasco here, but you could offer hot sauce on the side instead.) Stir in remaining 1/2 cup cilantro and serve pozole in deep bowls with accompaniments. Now, click on the link below to see the rest of this month's Secret Recipe Club posts. Really. Do it now.